Happy New Year! My Grandma King would always say that you would have good luck during the new year if you would see a young person on New Year’s Day. 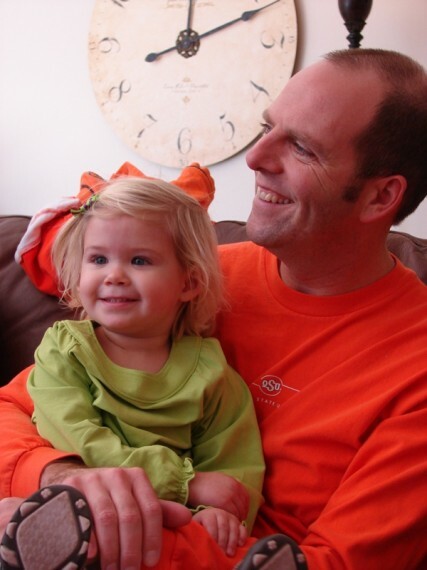 Between our kids and getting to see Morgan again this morning, we are due for another wonderful year. Our first stop of the day was to see Ryan’s new house in Dallas. This is his first house and he has not been in it all that long. It was our first time to see it. The first thing you notice about Ryan’s house is the rope swing in the tree in the front yard, and the huge play fort in the back yard. Ryan doesn’t have any children of his own, but he does have a niece who lives 20 minutes away, so this really worked out pretty nice for Morgan. 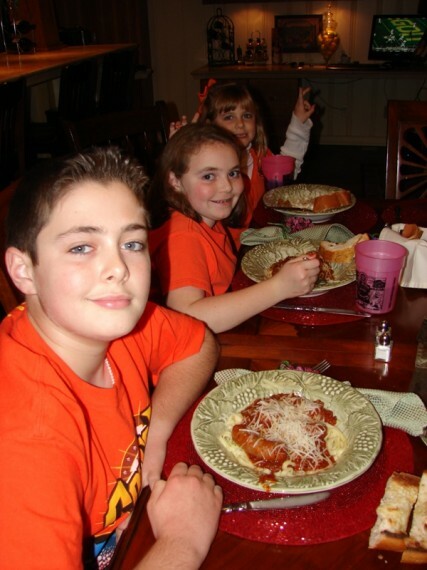 Rodney, Morgan, Mallory and Marissa. 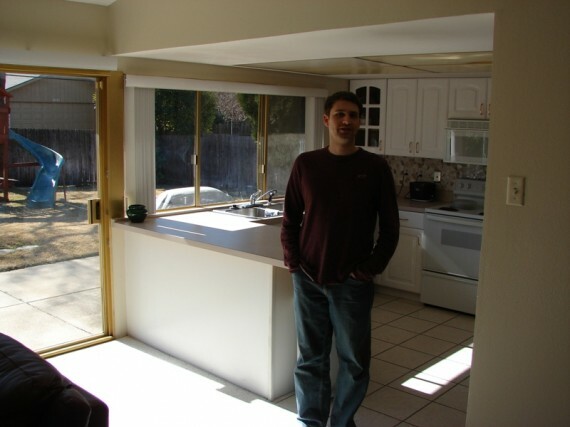 Ryan is proud of his kitchen! Beth, Rodney and Morgan were at Ryan’s house when we got there. So, in the span of 12 hours we got to see all of these family members a second time. This is awesome, because in years past, it would not be terribly uncommon that we might see them only twice in one year. After an hour so – which was plenty of time to scrutinize, nitpick and compliment Ryan on his house – it was time to shove off. At this point, the family members were going their separate ways. My group had plans to go see the Cotton Bowl parade and the rest of the crew had other plans. Our first decision was where to eat lunch. We had to choose between an old favorite, Uncle Julio’s, or a new place that Erin had recommended to us that made their own root beer from scratch. 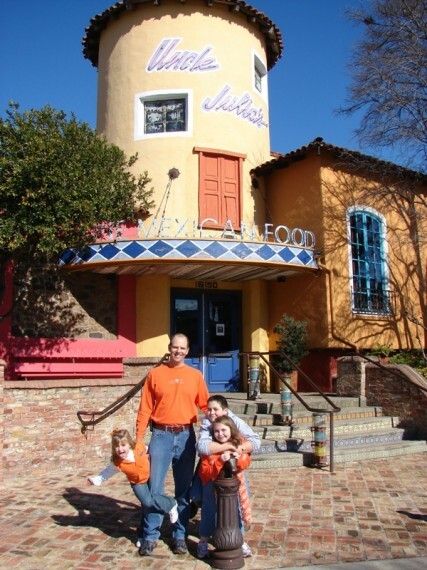 In the end, we had too many good memories of Uncle Julio’s to pass that up, so we took off to find the nearest one. A few years after I started my first real job, my boss left for a job in Dallas. Stephanie and I would drive down to see him on occasion, and he would make it a point to take us to Uncle Julio’s. So, we have a strong attraction to this place, and this was our kid’s first visit. The food was excellent as always and we had a good waiter. During one of his visits to our table, he asked us if there was anything we needed, and Mallory spoke up with “free dessert”. Well, believe it or not, the manager came by at the end of our meal with a free plate of sopapillas. Needless to say, we took care of our waiter. Next up was a trip to the Cotton Bowl parade. 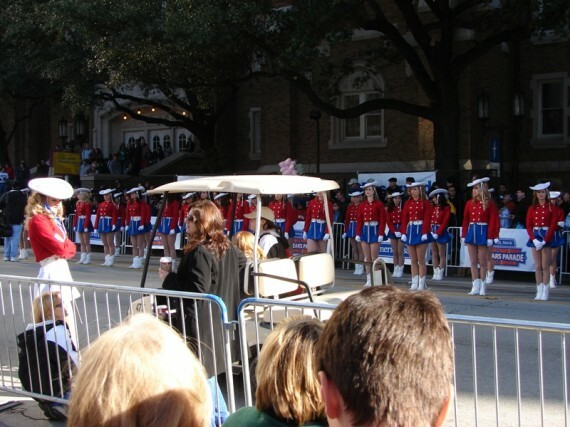 When we visited the Cotton Bowl last, in 2004, the parade was held at the fairgrounds, near the Cotton Bowl stadium. Since the game has moved to Jerry Jones’ stadium this year, the parade has also moved – to downtown Dallas. We made our way to downtown and found a cheap place to park near the start of the parade. We arrived about 15 minutes before it started, so our timing was dead on. We found a spot on the sidewalk very near the grandstands at the beginning, where we could hear the narration of the parade by the local television station. Actually, we were standing right behind some scaffolding that the t.v. cameraman was using to shoot the parade. It did not take long for our kids to make their way through the crowd and position themselves beneath the scaffold. 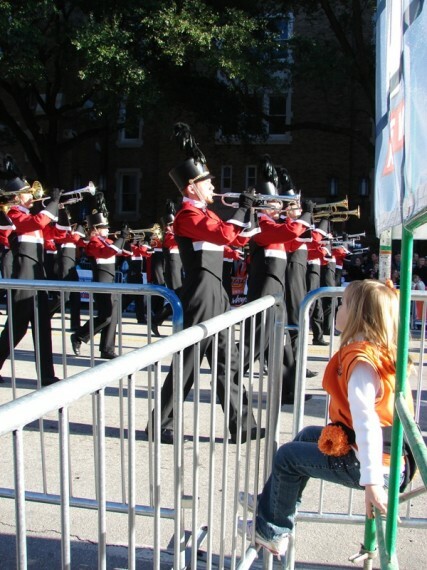 Marissa watching the OSU band. The parade was decent. 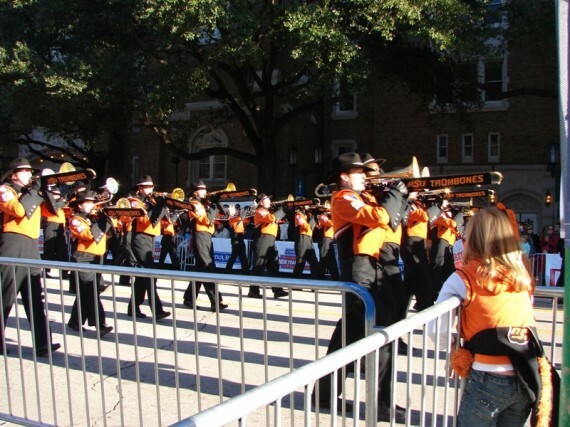 They kept all of the Oklahoma State and Ole Miss fans there till the end by saving our bands to the end of the parade. There was also a very noticeable lack of candy being thrown out by the folks in the parade. Isn’t that a staple of a parade? However, the kids did get kazoos, so we’ll take what we can get. After the parade, a pep rally of sorts was scheduled for a hotel downtown. 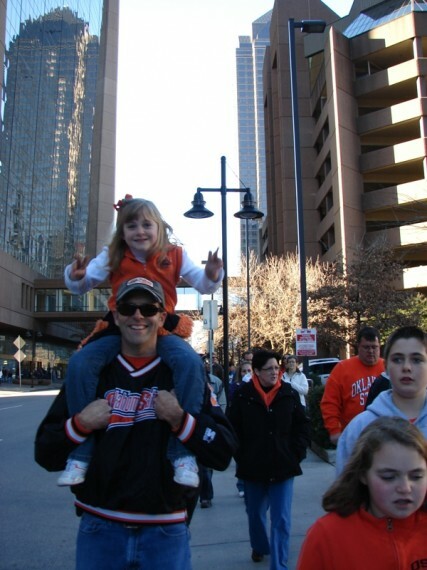 We decided to walk that way with most of the other Cowboy fans and check it out. 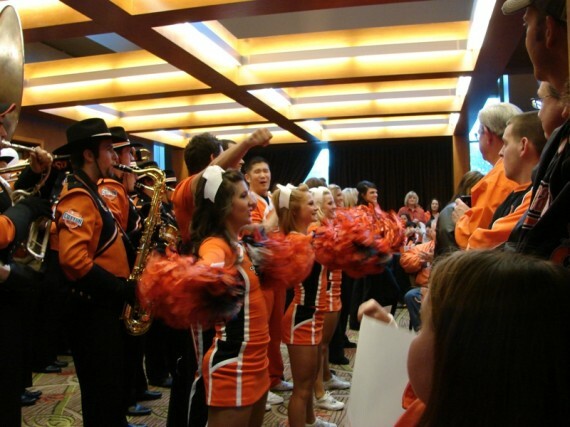 We found the hotel, and we found the very small banquet room inside the hotel the pep rally was to be held in. The pep band and spirit squads were late arriving at the rally, but when they did arrive, we had a front row seat. Literally, I could have held the girl’s pom poms between sets, or even spelled them if they needed a breather. Heading to the Pep Rally. After the pep rally, we realized we were about an hour behind schedule for our next stop – dinner at Stephanie’s college friend’s house. Stephanie called her up, apologized for our tardiness, and got directions. What seemed like another hour later, we arrived at their house in Arlington. Rhonda and Stephanie were sorority sisters at Oklahoma State. Rhonda and her husband, John, bought an older house and did a “little” remodeling. By that I mean that the interior of the house looks nothing like it did when they bought it. Walls and doors were moved and removed, and the place looks like a million bucks now. When we arrived, we had the pleasure to see another one of Stephanie’s old college pals, Sloan. She came over to spend a few minutes and catch up with Stephanie. It was definitely a reunion of sorts. 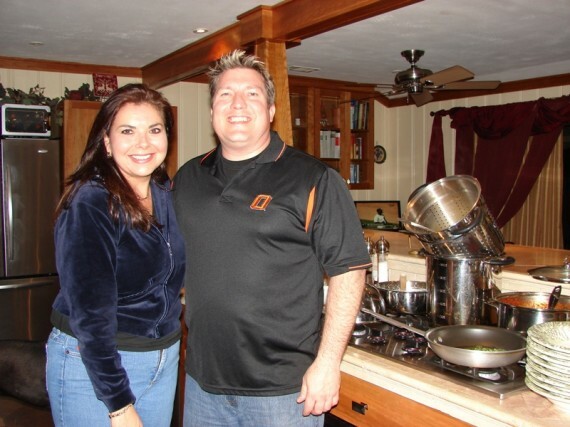 Rhonda and John in their gourmet kitchen. 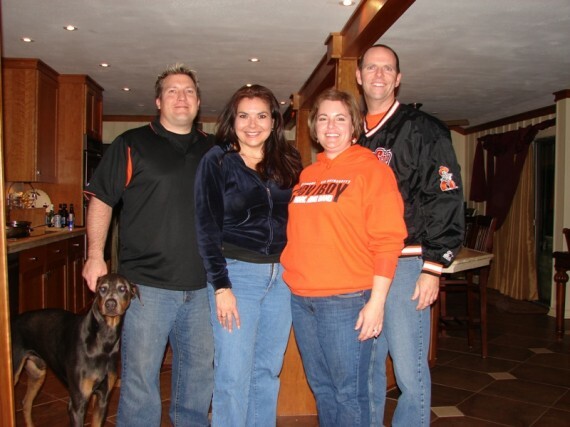 Rhonda, John, Stephanie & Steve. John is not a gourmet chef in real life, but he plays one at home. In other words, that is not his profession, but he can definitely lay claim to it. He cooked up a spectacular meal, from the appetizers to the main course, to the flaming dessert. All of the great food was accompanied by wine and beer. I enjoyed his wide selection and stuck to imports for the entire evening. 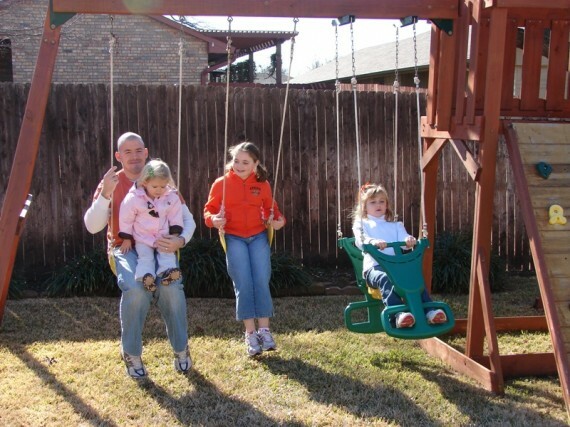 The Kids behaving at Rhonda & John's. Mallory was in love with their dogs and spent most of the evening entertaining them. I believe by the end of the night, those dogs were ready for her to leave. Miles watched the bowl games on the big screen and kept us updated as to what was going on. 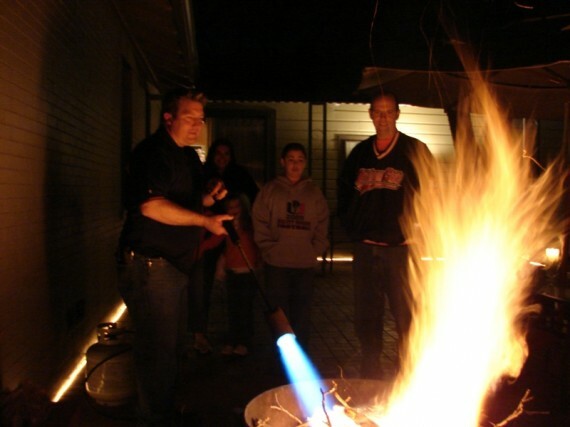 After dinner, John fired up the outdoor firepit, but even with the fire going, it was too cold for me. Reluctantly, we spent most of the evening inside. It was so nice for Rhonda and John to open up their house to us tonight. We had a blast catching up on old times and the food was out of this world. Time to get back to the rent house. Tomorrow is gameday!